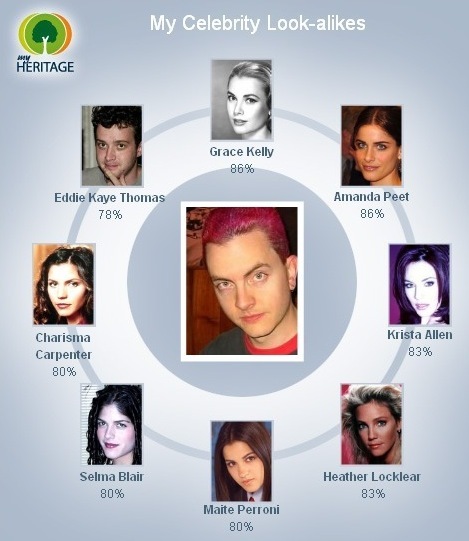 It’s funny enough that it only found one male “celebrity” (and who the hell is Eddie Kaye Thomas anyway?) that it thought I looked like. But Charisma Carpenter and Grace Kelly?! I am so far beyond flattered that I suspect this site’s programmers are trying to get into my pants. And for the record, I think it may have succeeded. Call me anytime, dears. Edit: Eddie Kaye Thomas appears to be an American character actor who’s not really “famous”, but who’s been in a ton of stuff, some of it reasonably good. He was Rosenberg in Harold & Kumar Go to White Castle, so I’ll take it as a compliment.